Japan will test the HTV Small Re-entry Capsule, shown here, to test payload return technology during its Kounotori7 cargo delivery mission to the International Space Station. The space capsule arrived at the space station Thursday (Sept. 27) along with 5 tons of supplies on Kounotori7, the seventh uncrewed H-II Transfer Vehicle resupply ship (also known as HTV-7) launched to the orbiting lab by the Japan Aerospace Exploration Agency (JAXA). Kounotori is Japanese for "White Stork." The HSRC is designed to transport experiment samples back to Earth protected 3 ways: with passive, non-electric cooling, a "vacuum double layer insulation container (thermos bottle) and a heat storage unit (refrigerant),'' according to JAXA's mission page. This NASA image shows the location and size of the HTV Small Re-Entry Capsule on the Kounotori7 cargo ship. The small capsule will test re-entry methods to return experiments to Earth from the International Space Station. To prep this capsule to send back to Earth, astronauts living and working on the space station will first load experiment samples into a payload container. Another prep-step is to add a separation mechanism, which absorbs heat that would otherwise affect the parachute, onto a cylindrical structure. Configuration of HSRC and payload container. 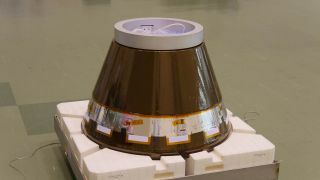 This cylindrical support (made exclusively for the HSRC) goes onto the hatch at the entry of HTV-7 spacecraft's Pressurized Logistic Carrier (PLC) and makes sure the enclosure stays airtight when the hatch of the vehicle is left open, according to the space agency. When HTV-7 undocks from the space station, the spacecraft will perform a deorbit burn to head toward Earth. Next, officials on Earth will command the release of HSRC from the vehicle, and the capsule will start re-entering our planet's atmosphere. HSRC will splash down with a parachute. Conceptual diagram of HSRC operations. The Kounotori7's payload also included a delivery of astronaut basics, like food. The launch also sent up several spacelab units, or experiment racks, including two US experiment racks called Express Rack 9B and 10B; the second large-scale glove box for scientific experiments on the space station, called the US Life Sciences Glovebox; and the European Space Agency's Life Support Rack, which will attempt to recycle carbon dioxide and water on the space station. Officials also sent up a special radiator equipped with a loop heat pipe, for an in-orbit demonstration at the Japanese Kibo Laboratory on the space station. Typhoon-related and unfavorable weather conditions had also prompted JAXA and Mitsubishi Heavy Industries to postpone the rocket's earlier scheduled flights for Sept. 11 and Sept. 14 .